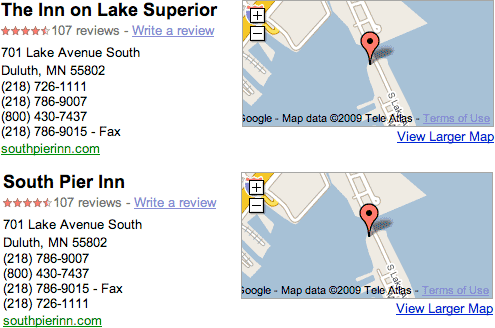 I found a very disturbing Google Maps issue via Google Maps Help forums. Mike Blumenthal has uncovered that Google is merging competing businesses that have nearby addresses. Let me say that again, but show you an example, that was uncovered by Mike. Yes, the algorithm for merging changed recently. The developers who work on this have been alerted and are actively working to address this problem. They are also reading this thread. The fix needs to be automatic - not manual. These things usually take several weeks to test and bring live. We know it's causing user pain and I know they are working really hard on it right now as we speak. Clearly Google knows how big of an issue this is and I hope it gets fixed soon. Mike Blumenthal has posted more information on this topic at his blog. Update: Marty at aimClear blog wrote about this on the 21st.